Discover Fluffy Tapioca Cream, infused with egg yolk and flavored with vanilla. 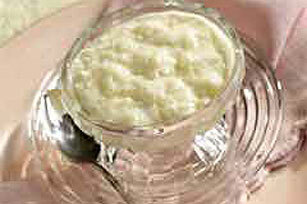 Serve Fluffy Tapioca Cream either warm or cold for a luscious dessert. Combine tapioca, milk, egg yolk and 3 Tbsp. sugar in medium saucepan. Let stand 5 min. Meanwhile, beat egg white in small bowl with mixer on high speed until foamy. Gradually add remaining sugar, beating constantly until soft peaks form. Bring to full boil on medium heat, stirring constantly. Remove from heat. Quickly stir egg white mixture into hot tapioca in saucepan until well blended. Stir in vanilla. Cool 20 min. Stir before serving. Combine tapioca, milk, egg yolk and 3 Tbsp. sugar in 1-1/2-qt. microwaveable bowl. Let stand 5 min. Beat egg white in small bowl with mixer on high speed until foamy. Gradually add remaining sugar, beating constantly until soft peaks form. Microwave on HIGH 7 to 8 min. or until mixture comes to full bowl, stirring every 2 min. Quickly stir egg white mixture into hot tapioca until well blended. Stir in vanilla. Cool 20 min. Stir before serving. Prepare using 1/3 cup MINUTE Tapioca, 1 or 2 eggs, and doubling all other ingredients. Makes 12 servings. Prepare recipe using 1 egg, and half each of the remaining ingredients. Makes 3 servings. For creamier pudding, press plastic wrap directly onto surface of pudding while cooling. Stir before serving.